From the high peaks of Mountains of the Mind to the lost paths of The Old Ways and the vanishing lexicon of The Lost Words, Robert Macfarlane has traced the way our landscape is fused with language, storytelling and imagination. Ten years in the making, Underland is his enthralling record of journeys deep into the worlds beneath our feet. From the burial grounds of the Mendip Hills to the hidden catacombs of Paris, and further, to the deep blue, ancient ice of Greenland, Macfarlane explores - through myth, memory and experience – our most feared and venerated spaces of loss, discovery and deep time. Written with lyricism, power and prescience, Underland brings together the ancient and the urgent in a revelatory examination of an unseen and essential netherworld. The highly anticipated new book from the internationally bestselling, prize-winning author of Landmarks, The Lost Words and The Old Ways. 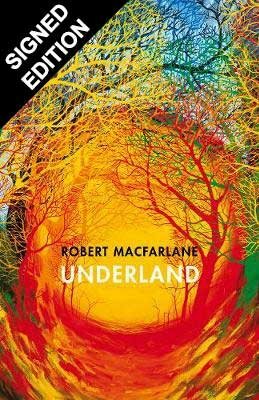 In Underland, Robert Macfarlane takes us on a journey into the sometimes vast and hidden worlds beneath our feet. From the ice-blue depths of Greenland's glaciers, to the underground networks by which trees communicate, from Bronze Age burial chambers to the rock art of remote Arctic sea-caves, this is a deep-time voyage into the planet's past and future. A British author and academic, Robert Macfarlane is an author of prize-winning books on the themes of memory, landscape, nature, environmentalism and travel and regularly writes for publications including the Guardian and the Times. His first book, Mountains of the Mind won the Guardian First Book Award and the Somerset Maugham Award. His other works include, The Old Ways, Landmarks and The Lost Words, a children’s book of nature spells created in partnership with artist Jackie Morris. Robert Macfarlane is Reader in Literature and the Geohumanities in the Faculty of English at Emmanuel College, Cambridge. His forthcoming book about subterranean spaces and deep time, Underland, will be published in 2019. Win a screen print of ‘Nether’ by Stanley Donwood signed by Stanley Donwood and Robert Macfarlane.